Pupils in Year 8 and 9 demonstrated a flair for creative writing when they entered a Rotary Writing Competition. 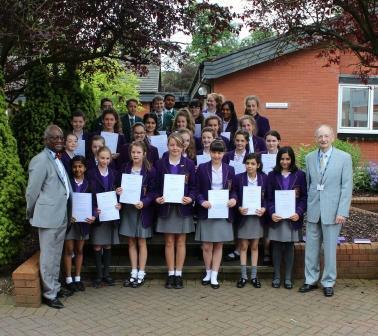 Many pupils were awarded ‘highly commended’ certificates and praised by Rotarians for the quality of their writing. Prizes were awarded for first, second and third place in two categories. In the intermediate age group, Rabia Majid was awarded third place, Amaani Valli second and Alice Beverage came first. In the senior age group, Baylie Thompson was awarded third place, Fateema Ahmed was presented with second and Isobel Jackson gained first place. Doctor Francis Apaloo, President of the Rotary Club of Blackburn Borough, handed out generous prizes of Waterstones’ vouchers and certificates in assembly. Isobel Jackson’s entry will go through to the Rotary national final. Mr Roy Parker, of the Rotary Club of Blackburn Borough, Chair of Youth Service Committee said that the stories will be read out at each meeting because they are so engaging. The English Department is very proud of our pupils’ achievements.